Lavish Polish - Summer 2016 Collection - Polish Etc. Today, I have a sweet little collection from Lavish Polish to share with you. This summer collection consists of three crellies and three crelly glitters in a variety of bright, almost neon colors. This collection is available right now, so let's get into the swatches so you can see which ones you want to make yours. Sunglasses & Flip Flops - A bright minty turquoise creme/crelly. It is quite opaque but still has a squishy quality. This polish made me think of Pepto Bismol but in a minty shade instead of that pink color. Weird, I know. But just had this look of slightly chalky but super saturated in color liquid. Application was great and this is two coats with a glossy top coat here. 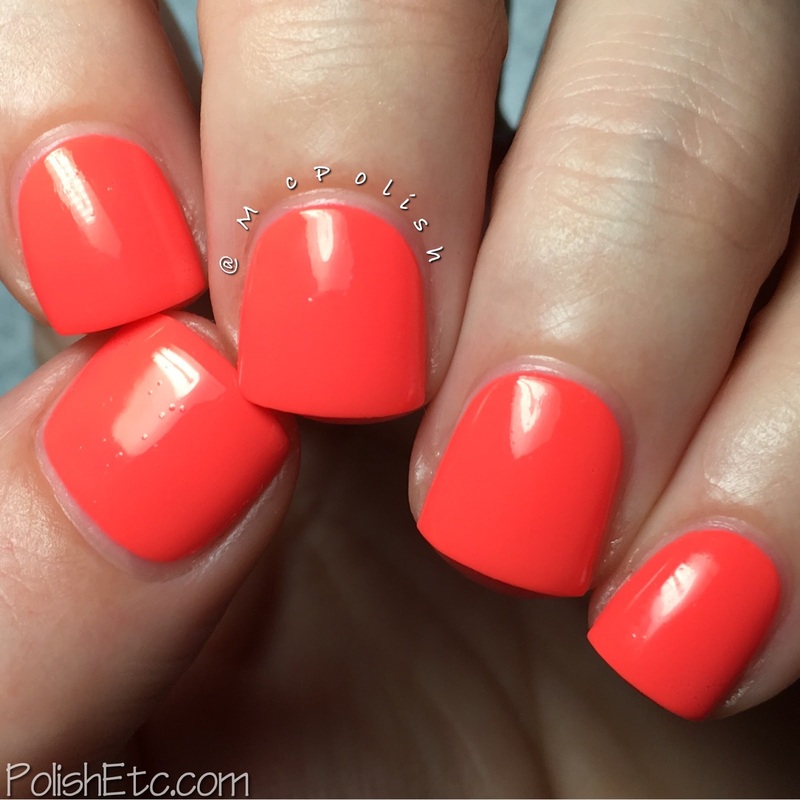 Beach Goddess - A practially neon coral creme/crelly. This is super bright and freaked my camera out a little bit. The color is slightly more pink toned in real life but this is pretty darn close. Good formula and I have two thicker coats with glossy top coat here. I can't wait to wear this on my toes at the beach! Splish Splash - A light sky blue crelly. This is almost a robin's egg blue (at least that is what several people told me when I wore this the other day). The formula was a little bit streaky on the first few coats but it all leveled out well with a third coat. I topped with off with a glossy top coat. Popsicles - A deep lavender crelly with matte neon dot glitters and a sprinkling of tiny neon glitters. This is a fun concept for a summer polish. The formula was okay and I only needed two coats for full opacity. The base is a little more opaque than the other crelly glitters in this collection. It seemed to cover up the glitters more. I topped this off with a glossy top coat to get a nice smooth finish. 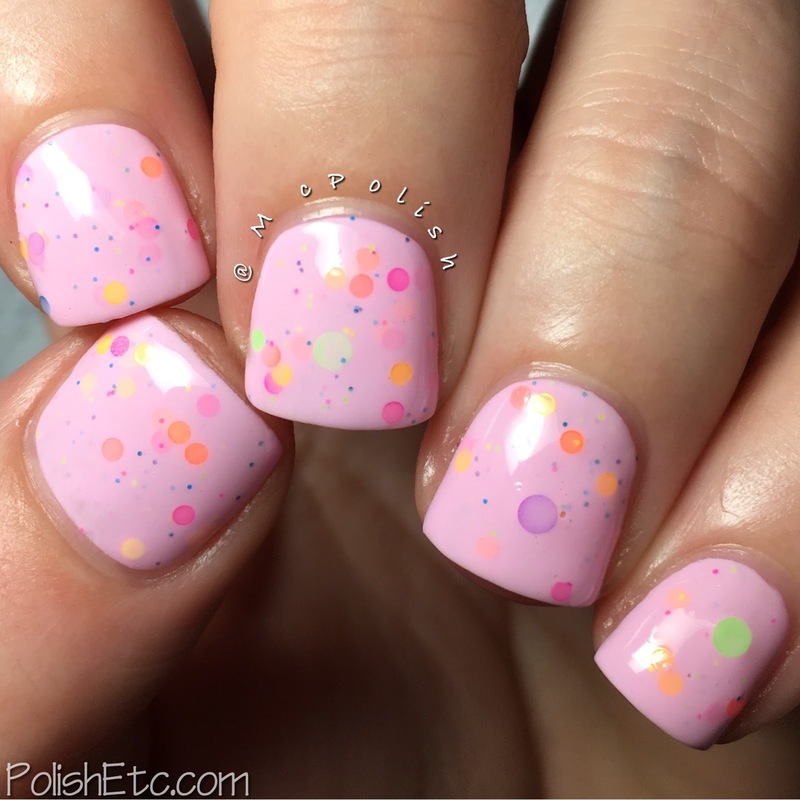 Pink Lemonade - A light cotton candy pink crelly with the same mix of matte neon dot and tiny glitters. I think this mix of colors is great! Very girly and fun for summer. The base is less opaque so the glitter peek through better. I was still able to get this fully opaque in two thicker coats. A glossy top coat smooths everything out nicely. Sandcastles - A neon yellow orange crelly with the same mix of matte neon glitters. This is another color that freaked my camera out. It is super bright. If China Glaze's Flip Flop Fantasy and Sun Worshiper got together and had a baby, it would be this base color. I used two thicker coats with a glossy top coat for this swatch. The Lavish Polish Summer 2016 Collection is available right now for purchase. My faves are Beach Goddess and Sunglasses & Flip Flops for sure. Which ones are you in to? They are each $10 or you can get the entire collection of six for $55. And if you want to save even more money, use my code 'MCPOLISH15' at check out for 15% off you order. Yay! Oh! These are all so yummy!